← Does it count as Play in Nature if you are eating it? I think not but here I go! About a year ago I went to the Hilton Head, Savannah, Charleston area to look for food and relaxation. 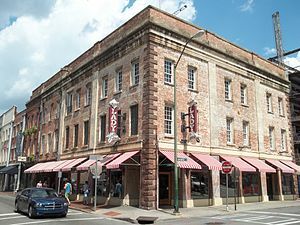 One of the places I REALLY wanted to see was Paula Deen’s Lady and Son’s Restaurant. I dragged my husband from Hilton Head, SC to Savannah and told him all I wanted to do that day was eat at Paula’s. We got there, parked and walked to the restaurant. Thinking I would easily get in ( what was I thinking?) I walked up to the woman at the kiosk/pulpit outside of the Lady and Sons and talked to the woman there. She said that we would have to wait TWO hours! I figured I had come all the way from Chicago and 2 hours would be ok so I got my name on the list for 3:00 and went across the street to the tour company and bought two tickets to ride around town and get a history lesson while we waited. At least that was the plan! I felt like we were on Gilligan’s Island with no way back to civilization! Stuck on the Da@#% Trolley Car we got stuck in traffic! ON A HILL in a PARKING LOT! FOR ….EVER……….! The stupid woman driving our Trolley Car (trying to be cute I am sure) Kept telling the same inane story about when someone does something to you then you should bless their heart as the saying goes. But with her it kept going and going and going. If she had said bless your heart one more time I swear I was gonna vomit! Right there on the Trolley Car! What seemed like a year and a half later but really only 2:45 hours, or 1457 Bless your heart’s later we arrived at the TROLLEY HOME BASE! No kidding. It was time for the driver to GO HOME so they dropped us off there so some guy with a bus could pick us up in another TWENTY MINUTES and take us their kiosk across the street from Lady and Sons. We get off the bus and I run across the street to the woman at the pulpit only to be told it is too late. I missed my time and we would have to wait until 6:00 for dinner. About to cry, I let her put my name back on the list. We went to a FABULOUS Tapas Bar called Jazz’d to get a drink and something small to eat to tide us over until we could get in to Paula’s. Folks, Jazz’d was fabulous! It is in the basement ……..or at least under ground. You have to go down the stairs from the sidewalk to get there. The restaurant, bar, staff and décor were FABULOUS! The food was some of the best we have ever had on this planet. The scallops were to die for! My husband doesn’t think he has ever had better. So after a couple of much needed drinks, some awesome food and a look around we went back up to the street to start walking around. We went in a cool cooking shop, a dog paraphernalia shop and on to the street Lady and Sons is on. Just as we turned the corner I locked eyes with the woman at the pulpit and she came running down the street to me with a pass to get into Paula Deen’s! Yea! Finally! So we were let in the Paula Shrine and walked to the elevator to the third floor. ( this place is huge and BUSY) We were seated and because we had just eaten neither of us was starving. I got the fried green tomatoes, which I think were brought to the table regardless. The Macaroni and Cheese and some Key Lime Pie. My husband got some fried chicken from the buffet. I have to say it was worth the wait. Yum! Then we went next door and bought something for nearly everyone I know because Savannah, Georgia and Joliet, IL are very far apart. All this is leading up to my exciting news. Paula Deen is opening a restaurant here in Joliet! Inside of Harrah’s Casino. I am so excited! Now I can go there every day if I want. And I may want to! At least until I get really sick and tired of Fried Green Tomatoes and Macaroni and Cheese. My 86 year old mother is REALLY looking forward to the Key Lime Pie. So for those of you closer to Joliet, Illinois than Savannah, Georgia I will be looking for you in line down at Harrah’s Casino. And while you are here please drop by and say Hello to me at Pilcher Park. Get out, stretch your legs and walk on my trails. If you are here in the summer be sure to stop by the Lord and Burnham designed Bird Haven Greenhouse and see the formal gardens. If not, go on in and take some photos in the warmth of the greenhouse. We will show you some Southern hospitality worthy of Paula Deen. This entry was posted in Uncategorized and tagged #harrahscasion, #harrahsjoliet, #ladyandsons, #pauladeen, #pauladeendiabetes, Bird Haven Greenhouse, diabetes, fried green tomatos, Georgia, Harrah's Casino, Lady, macaroni and cheese, outdoors, Paula, Paula Deen, Pilcher Park, Pilcher Park Nature Center, Savannah, Savannah Georgia. Bookmark the permalink. 1 Response to Here Comes Paula Deen! It was interesting to read through this. Keep up the great work, I will keep visiting to see all the latest updates.